Gorgeous bag to use almost everyday. 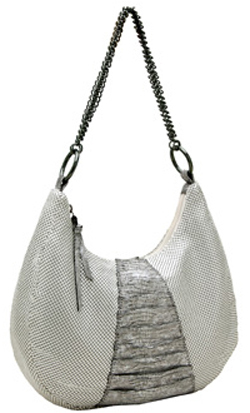 Metallic ruched Italian leather inserts adorn the body of the bad in metal mesh. Heavy chain handle. This will be the bag you simply love to carry anytime. Larger in size so you can carry your daily belongings everywhere you go! Size: 11½" x 11¼" x 3"